Warning: Do Not Pry Into God's Judgments! Can Psychics Help to Solve Crime? Mount Athos Featured in "National Geographic"
Who Wrote the Gospel of Matthew? Patriarch Bartholomew Gives Muslim A Koran! Which Saint Has the Best Cash Flow? 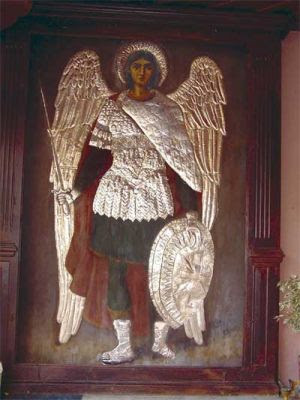 The Archangel Michael of Mantamados (Gr. O Μανταμάδος) refers to a miraculous icon of the Archangel Michael on the island of Lesvos and is one of the four miraculous icons of the Archangel in the Dodecanese of Greece. The monastery is known locally as Taxiarches (the Archangels) and the feast of the icon is celebrated on November 8 (the Synaxis of the Bodiless Powers) and September 6 (the Miracle at Colossae). There are two accounts surrounding the date of this icon, one having to do with the Ottoman Turkish occupation and destruction of 1462, and the other with Saracen pirates during the 9th and 10th centuries during which the entire island was invaded. In either case, the story of the creation of the icon shares the theme that the target of the raids was the Monastery of the Taxiarchis. The pirates threatened the monks with death if they would not reveal the whereabouts of the hidden villagers (some say treasures of the monastery). The monks refused and the invaders slaughtered all of the monks except for one novice-monk, named Gabriel who remained hidden. As the pirates where leaving, the novice climbed to the roof of the monastery to be sure that the pirates had left. However, the pirates noticed him from afar and returned to kill him as well. It is at this point in the story that the Archangel Michael makes his appearance in front of the Saracens with his own sword drawn forcing them to retreat in terror. Thanks to this miracle from the Archangel the monk survived and descending to the courtyard buried the bodies of his fellow brotherhood. 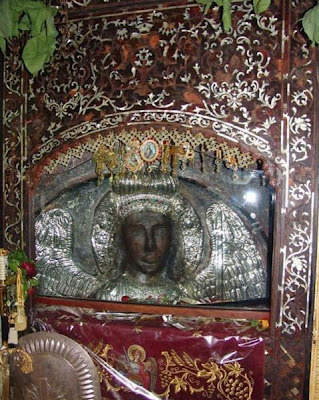 The monk still in deep respect and reverence for having witnessed the Archangel Michael in all his fury, gathered up the earth that was red by the blood of the martyred monks and shaped it into the icon-sculpture of the Archangel as it is today; while it was still vivid in his memory. According to legend, the monk did not have enough of this dirt-blood mix and so the head of the Archangel has turned out disproportionately larger to the rest of his body. Centuries have passed but the ‘bas-relief’ icon still preserves its freshness and remains as if untouched by time and the kisses of thousands of pilgrims. On the cheeks and forehead of the icon, believers place metal coins (for blessing) that leave marks on the face though these marks then fade away. From time to time, the Archangel’s eyes are filled with tears which Christians wipe away with little pieces of cotton. They do the same with the beads of perspiration which occasionally appear on the icon. Another miracle is that a good and faithful person who approaches the icon to pray may receive a unique reaction from St. Michael the Archangel. The expression on the face of the icon might change to a healthy shade of red and sometimes there is a joyful smile on the face of the icon. But when a bad person approaches the icon, the Archangel Michael’s face darkens and becomes fierce and, on certain occasions, some people are held back from approaching by an invisible force. It is widely believed that the Archangel has appeared many times in the past to the Turks by whom he is respected and revered but also feared. Offerings to the Archangel vary. Inside the church, a variety of military offerings such as swords, shields and uniforms may be seen. 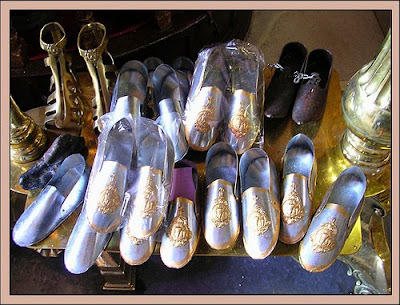 One of the most famous offerings to the Archangel was a pair of metal shoes known as “the Archangel’s Shoes” which subsequently showed signs of wear. 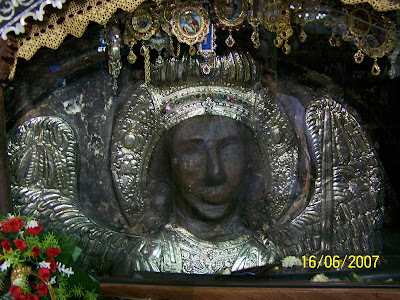 Thereafter, more pilgrims have brought metal shoes and placed them near the Archangel’s icon. They then ask him to help find what they are searching for. Young ladies usually ask for help in finding a suitable husband. When their paths lead them back to the monastery, the pilgrims search for the shoes they had offered the Archangel. They then check the sole to see if the shoes have been worn and, if they have, it is a sign that the Archangel has used them to search on their behalf and that their prayer will be answered; if not, they take it to mean that he has not yet had the time to carry out that search! On 20th July, 1974, from the early hours of the morning, the radio was broadcasting news of the invasion of Cyprus by hostile Turkish forces. 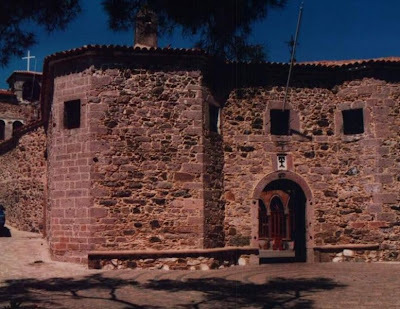 On the morning of the day after the Turkish attack, the sacristan of the church of the Archangels in Lesvos arose very early. As he put things in order in the church, he came before the full size image of the Archangel, which is located on the right hand side of the courtyard, to light the vigil candle when suddenly the sacristan stood mesmerized as if he had turned to stone. His eyes gaped as he searched for the icon of the Archangel which was missing. He was bathed in a cold sweat. His trembling hands made the sign of the Cross time after time. “But, how is it possible” he kept saying to himself “for an image two meters by one and a half, painted directly onto the wall and with a huge frame, to have disappeared?” He was still standing in the same position when the priest of the church arrived to say the daily Liturgy. He was surprised and concerned to see the look of amazement on the face of the sacristan whose eyes were glued to the same spot to which he also pointed with his hand. The priest turned to see what had so affected the sacristan and saw that, in the place of the Archangel’s icon, there was a massive brown-colored frame. News of the event spread rapidly through the neighboring villages and to the island’s capital, Mitylene, and there were many people who wanted to witness the miraculous event with their own eyes and to worship there. The icon was missing for a whole week. The icon suddenly reappeared in its original place, in the same miraculous way as it had disappeared. Time went by. One cold winter morning the sacristan of Mantamados heard the galloping of a horse. He went outside and saw a young man who had just gotten down from his horse and was carrying a goat on his shoulders. 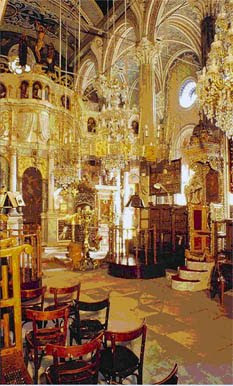 They entered the church together and the young man proceeded to the Archangel’s icon and left the goat in front of it. He then lit a candle which was as tall as he was. He then knelt down and worshipped before the icon, caressing with trembling hands and eyes full of tears the clay face of the Archangel. “He is my saviour” he said passionately, turning to the sacristan. “He saved me from the Turks!” “Tell me, my boy, what happened?” asked the sacristan with interest as they walked out of the church. “During the last incidents between the Greeks and the Turks,” began the young man, “I was carrying out my military duties in Cyprus. It was past midnight on August 12th, when we were caught unexpectedly in the firing line of the Turkish Cypriots. We were always on our guard because we knew how treacherous the enemy could be. We were having difficulties with their naval attack but were unharmed by their air force fire. Within a few hours, we had the situation under control and prepared to counter-attack. It was as if we had wings on our feet. We hunted them down and almost chased them into the sea. Full of enthusiasm, we were running towards the enemy with almost no back up. Suddenly, I see not more than five meters in front of me an unidentified shape. I stop immediately and then, in the hazy dawn light, I see clearly that it’s a Turkish machine gun! I see the barrel of the gun turning towards me and, having nowhere to hide, I fall to the ground and cover my head with my helmet. 'My Archangel!' I say to myself. 'Save me!' The moment I uttered these words I remembered my father who was miraculously saved from certain death during the Albanian war, after he promised to bring a goat to the Archangel. 'My Archangel, save me!' I murmured again, making the same promise of the offering of a goat. "At that moment, a deafening noise almost took away my hearing. 'I’ve been shot!' I thought to myself and images of all those I loved crossed my mind. Then, I felt someone touching me, searching for me, lifting me. They were our people. “'Are you hurt? How do you feel?' I vaguely heard them asking. I checked my body with my hands but found no wound. Then, I remembered the machine gun and looked towards where I had seen it but saw nothing. 'Right here!' I shouted. 'There was a Turkish machine gun!' We went closer and checked but did not find it. In the place where it had been located there were only shards and a huge hole in the ground. "It seemed that at the critical moment, a ship’s bombshell or some other mortar shell had totally destroyed the dangerous machine gun, while a superior force kept me safe from any harm that the explosion or fire might cause me." The sacristan listened carefully to the young man’s story and seemed deeply moved. He then said: “Yes, my boy, it was the Archangel who rescued you. Just when the Turks invaded Cyprus, this icon mysteriously disappeared for a week!” The young man was stunned. He gazed tenderly at the icon of the Archangel Michael, his eyes filled with tears. It was one more “thank you” for that unexpected rescue. One of the numerous miracles of the Taxiarchi of Mantamados in Lesvos (Mitilini) is the healing of a young boy, Vasilis Karastiras from Athens, Greece. The Archangel made an apparition to that boy. Young Vasilis was playing when he fell and injured his head very badly. He was transferred to the nearest hospital where they claimed blindness and paralysis caused by the trauma. “I’m afraid, not” the head doctor replied. So the father took a pen and signed the forms allowing the operation to be performed on his child. The child was taken to the operation room and while he was being prepared for the operation, according to his memory, the darkness of his eyes flew away and a bright vision took its place. He was standing before a temple with arches and the front exterior wall of the building was made of red rocks. A blinding light was coming through the temple’s open door. The child approached, kneeled before the lad, embraced his legs and leaned his head over his left thigh. The lad stretched his hand to pet the child’s head. Before the vision was gone, the little boy’s eyes caught a glimpse of a dark figure with silver wings standing inside the temple. The operation was a success! The paralysis and the blindness were cured. The doctors said that it was a miracle! The day on the calendar was the 8th of November, the day we celebrate the Great Taxiarches. Years went by and Vasilis was desperately trying to locate the place he had seen in his vision but all his efforts gave no fruit. That was until one day, when he recognized the temple of his vision in a television show. Deeply moved, he set off as a pilgrim to the Taxiarches Monastery, to offer his savior his tears of gratitude. The Taxiarchi's interventions in Mrs. Michailaris’ life from Elefsina are written below. She used to be childless and so was her sister, that’s why they both turned to the Archangel Michael's assistance. Within four years, her sister gave birth to a child but she didn’t. Nine years had gone by, so she started getting desperate. She turned to science. Hard times with no results. She was then informed that there was a doctor in England that could give one percent chance of giving birth after operating on women and she prepared her luggage for a trip to England. But she felt a conscience control. At the last minute she hesitated. She thought of turning to the Taxiarchi for enlightenment on her decisions. Within a month she was pregnant and she gave birth to a cute baby girl, Barbara. When the girl turned six, she took her and went to the temple to do a vigil of thanksgiving together. Later on the faithful woman lived another miraculous proof of the Archangel’s protection. On the day the Taxiarches are celebrated, in 1989 she experienced a harsh and intense pain in her uterus. Within a short period of time it got worse. The necessary medical examinations were done and she waited for the results. The doctors talked about operation. When she heard of that she refused to do it and started crying like a baby. She, again, turned to the Taxiarchi and prayed with faith to him so that he would again make a miracle. Praying relaxed her troubled soul and when she went to bed she had a dream of the Virgin Mary - as a queen on her throne - and the Taxiarchi standing beside Her. They were both smiling at her. The next morning she set off for the hospital to do the pre-operation tests. She had too many tests and waited for the results. Then, the doctors called her and said to her that she was totally healthy and that she could go home! She has been healthy ever since and she praises the Lord for the Archangel’s grace He has given us. Information in this article is extracted from the book Poetic History and Miracles of St. Michael, the Archangel of Mantamados, 4th edition, authored by Fr. Eustratios Dissos, Abbot of the Monastery of the Archangel of Mantamados.